This candle has a nice woodsy scent, lasts a long time but not too overpowering! This candle that I received as a gift last year has the most delightful fragrance of any candle I have owned. When I walk by the table where it is sitting, I get a whiff of fresh evergreens every time. Throughout the Christmas holidays it smelled like a new balsam tree was residing in our living room, even after the removal of our decorated tree. The candle I recently purchased is a birthday gift for a friend who loves forest scents. I have no doubt that it will be happily received. This is the best and most lasting Christmas fragrance which makes it a great value. The Frasier Fir scent has become my new favorite for winter. Clean and natural scent, which I prefer over sweet and spicy fragrances. This is my absolute favorite candle..I burn it all year long because I love the smell. I LOVE this candle. It fills my home with its scent! I looked everywhere for another after Christmas and they were out of stock in all locations. I found this online site and hope to keep one on hand year round. It is like being in the mountains of Oregon...my favorite winter place! Q: Is this candle soy? A: The Frasier Fir candles are made of food grade paraffin wax. This wax is highly refined and it will completely burn and not produce any smoke. Paraffin wax is far superior to soy wax in fragrance throw. Q: Is this candle one of the older one and it is not in the all green container? A: What is old is New again! The Frasier Fir candles with the Pine Needle design was re-introduced again for the 2013 Holiday season. 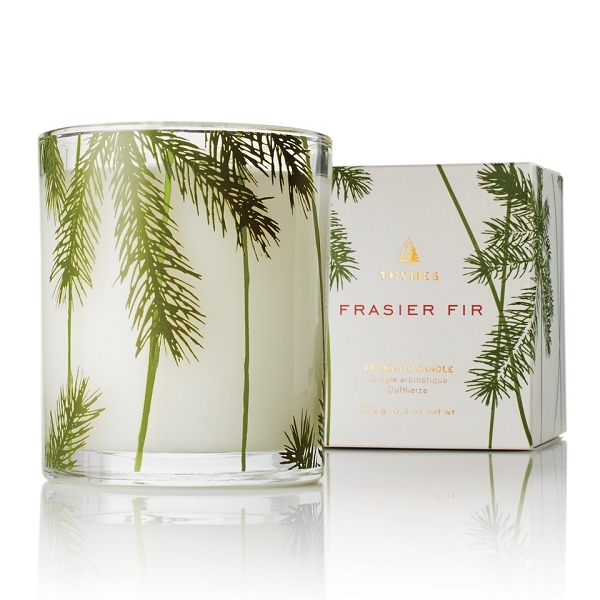 You can find the Frasier Fir Candle in Green Glass here. Q: The Frasier Fir Candle-Original says it burns 50 hours but the same candle in green glass says 40 hours. Why are they different? A: All the burn times are approximations and your actual burn time will greatly vary depending on many factors including how long your burn the candle each time, ambient temperature, humidity, drafts, wick length as well as the batch or that particular candle which will determine the exact content. Probably for both Frasier Fir candles the range is 40 - 50 hrs.